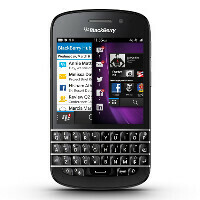 Last week RIM... um, we mean BlackBerry, introduced its long, looong-anticipated BlackBerry 10 handsets - the Z10 and Q10. The more interesting model of the two is the Z10, of course, as it is a full touchscreen handset, and we all know that full touch is all the rage right now, and will probably continue to be for the foreseeable future. That said, the Q10's presence at the event remained somewhat unnoticed, as all the attention was directed at the Z10. This brings us to the question: Is there a future for a BlackBerry device with a physical QWERTY keyboard? You've probably heard BlackBerry CEO Thorsten Heins repeat again and again that BlackBerry has a very loyal following, which demands the full, physical QWERTY experience, but it seems that if BlackBerry continues to serve its small and loyal following, it will be destined to remain a small, niche player. However, choosing not to serve its following would of course be quite risky, because there isn't any guarantee that its full touch phones will gain the needed traction in order to keep the big, Canadian ship afloat. That is why the company is now trying to satisfy the needs of both its loyal fanbase and all the customers out there who just want a device with a large touchscreen. Whether BlackBerry will be successful in this game remains to be seen, but at least from our standpoint, it's extremely easy to say that there's little to no interest in the BlackBerry Q10, at least compared to the new Android or iOS handsets. So, is it worth it for BB to go trough the trouble of producing such handsets? Maybe yes in the short term, while there are still enough QWERTY lovers out there, but it doesn't take a genius to know that this market will soon become so small that BB will be forced to put all of its effort into making full touchscreen smartphones. However, we aren't sure if it won't be a better move to just get rid of the QWERTY and start working on a serious, promising touchscreen product. The Z10 is OK, it closed a big part of the gap between BlackBerry and all the other smartphone manufacturers, but it's nowhere near what the company needs in order to seriously compete with Android and iOS. Let us hear what you think, guys. Should BlackBerry continue pumping those QWERTY phones into the pipeline, or that form-factor is now a thing of the past? QWERTY all the way! QWERTY is dead. "It's not about the keyboard. It's about sending a message". I don't think it is...or it will, as long as the hardware within is top-notch. However, i think there should be one more option for us like: "Yes, qwerty will exist at a rate". I didn't vote cause i'm "none of the above". I don't have anything against people who loves physical keyboards, I just state my opinion and my opinion is that physical keyboards will die and we already can see that happening for a few years. Today physical keyboard is becoming even more and more rare case. its not rare, your just not looking! theres more then you think! oh no! a lot of people still is a typer not a tapper! especially me! i hate misspelling on virtual keyboard and its really a bothersome! while on physical QWERTY, not a problem! but i do like the swype on symbian (or android) though and that virtual keyboard of Z10 is just amazing! Key point in what you said - "five years back". Five years ago soft keyboard solutions were still in their infancy. And five years back, phones with resistive touch screens were still common. FFwd to today, screens are capacitive, and soft keyboard solutions have become much more sophisticated. It's not a double standard - it's progress. Yep! more people being killed while texting,,wasnt a big problem like it is today, gee theres even a 'no texting while walking now' ill let you figure out what state thats in...people doing dumber things while texting, etc, etc, YEP! thats progress all right! Well now that Android phones have grown in screen size I don't see a need for a physical keyboard. With my OG Droid I loved my keyboard but when I moved up to a larger screen I didn't mind not having it. With the lovely 3.5 inch or even the 4 inch screen on iPhones I would still want a physical keyboard but with a 4.5"+ screen the need isn't there. YES ! Some of us can not stand touch screens we need buttons. And the portrait keyboard ASHA series from Nokia is VERY popular in europe/asia/africa, as are BB QWERTY phones. Just because some don't use it doesn't mean others don't want it. The DVP was an awesome design (and is better with 7.8), one that was poorly marketed, and not sold in stores, etc.. due to Dells incompetence. So sorry.. but its Not dead.. its dead to US consumers.. and the makers of the phones that want to keep the price down (QWERTYs cost more to develop). But its not dead, to say so shows how uninformed of the world market you really are. The article is about as biased as they get.. I would not doubt it if he was a iPhone user that never looked at anything but the high end slab form factor phones. I want a BB that is like the Dell Venue Pro, even better a new Windows 8 Phone. At some point, I will start looking at authors and just not pay any attention to what Ray S writes. I have a lot of respect with the other authors here, and they actually write fun/thought provoking articles that remind me why I come back. Ray S? Seems to hate most everything. (Find a positive Windows Phone article from him. Dare ya.) And a portrait slider for WP, or any other OS for that matter??? Count me in. Love that form factor. Qwerty phones have become niche products and are going to stay that way. I didn't like the poll options because it is nether thriving or dead. Its getting by would be more accurate. I think it'll have a place if BB10 is successful. I don't mind touch keyboards but I know some friends (who don't know much about tech) who say they want physical keyboards. And maybe some older business people who like physical keyboards. Still I think its a niche feature. And I hope BB10 does well. More options always good. Possibly Niche, but if you go to LGs site you will see a large number of Landscape sliders. I mainly see landscapes being used by teens though. The portrait slider, I know it seems counter intuitive, even though it has small keys. Is easier to use for those with big hands. My thumb is so big I often hit the wrong character on screen. But with a portrait slider I feel the buttons, and they quickly slide under my thumb and quickly I may add. I find it 2x as fast and easier to use than a landscape slider, and 5x faster than on the screen keyboard. It maybe a niche, but its a big one.. Why WP8 doesnt have one yet is beyond me.. they want the business class, and business users are used too and in some cases (like me) prefer the portrait keyboard. There is now, and will always be, a large enough segment of qwerty users to support physical keyboards. BlackBerry is smart to recognize this, and also recognize that the Curve/Bold/Torch (portrait sliders, of course) crowd wants this option from BB right now. It would be the height of stupidity to not offer their core users a qwerty option. But, full touch screens are the rage. Multi-media users want larger screens, and they are the bulk of premium smartphone buyers. BlackBerry was also smart to push the Z10 over the Q10. Q10 buyers are theirs. It is the Z10 audience they need to convince. There's still many people that prefer having a physical keyboard... It will die eventually.